The recipe I picked is another classic. Tomato soup. Now tomato soup, for me, is comfort in a bowl. Its such a classic flavour, and one that you can never go wrong with. We were lucky enough to have a fairly decent tomato harvest from the garden, and Kay ripened several in a bag with an apple, which, somehow or other encouraged even the green ones to ripen up. The sun-ripened ones from the garden rarely ever made it into a dish, as they were pretty much gobbled up straightaway, but these indoor ones were perfect for this soup. Somehow or the other, roasting always lends such an intense flavour to tomatoes, especially if they are not quite the best of the crop. Not that I mind, because nothing can beat the taste of a tomato from your own garden, no supermarket tomato even comes close to that stunning tangy flavour. I played around with the herbs for this soup. I used fresh rosemary from my garden instead of the thyme, and I ignored the cream. In my humble opinion, roasted tomatoes need no cream to dilute their strong and flavourful taste. I also adapted the method a little bit, so am posting up the recipe. For me, this recipe embodies the essence of local, you can't get more local than walking out into your backyard and picking all those lovely fresh goodies that Mother Nature serves up. I teamed up this soup with a sprinkling of spicy croutons. I never really have much luck with making croutons normally, as I tend to forget them in the oven, and then I have a mess of charred bread. This time round, however, I timed myself, and these came out pretty well. I added a sprinkling of chilli powder, cumin and pepper to spice them up a bit, and the results were pretty good, even if I do say so myself. The croutons jazzed up the lovely tangy flavours of the soup, and all in all I was pretty happy with the way this recipe turned out. You can, of course, ignore the croutons all together, but I always feel that thick, creamy soups are so good with that little bit of texture! Dom from Belleau Kitchen and Jacqueline and Lisa who host No Croutons Required have teamed up for a joint event, Random Recipes does No Croutons Required. Its such an interesting event, I am so glad to be able to take part. I managed to miss last month's Random Recipe, thanks to a packed month and some inherent laziness, but I sure hope this entry makes up for it. As it turns out, this recipe is also suitable for Lynsey's Sweet Heat Challenge... not that I am lazy mind, but fate made it so [I blame fate for everything :-)] So all is well that ends well after all! Preheat the oven to 400 F. Place the tomatoes in a single layer with the cut sides facing up, and sprinkle over some olive oil, and some pepper to taste. Sprinkle over the rosemary leaves. 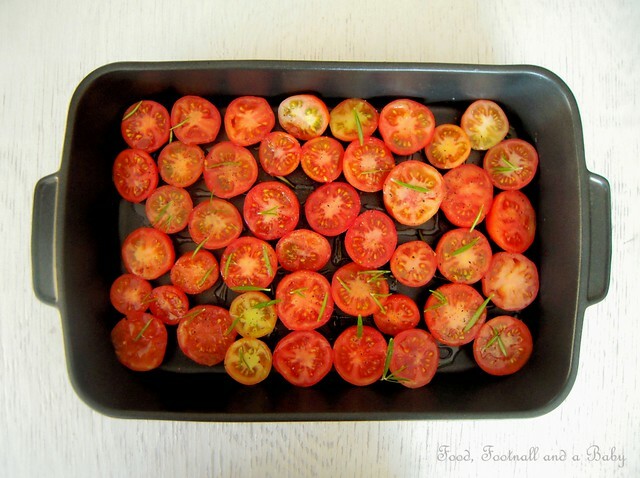 Roast for about 30 - 45 minutes, checking every so often, until the tomatoes are wrinkly and getting slightly charred. Leave to cool completely. Meanwhile, fry the chopped onion, celery and carrot in the 1 tbsp olive oil in a heavy pot. Cook for about 7 - 8 minutes, until the onion has softened. Add the garlic and cook for another minute. Add the vegetable stock, and boil until the carrots and celery have softened, about 5 to 10 minutes. Cool. Add the roasted tomatoes to the above soup base, and blend to a smooth and creamy consistency. If you feel that the soup is too thick, thin it with a little hot stock. Taste, and adjust the seasoning to your taste. Gently reheat and serve with the croutons sprinkled over. To make the croutons, again, preheat the oven to 400 F. Brush the slices of French bread with some olive oil, and place on a baking tray in single layer. Sprinkle over the chilli powder, pepper and cumin. Toast in the oven for about 6 - 7 minutes, until crisp and beginning to turn golden. Chop coarsely and serve with the soup. What a beautiful soup! I would love to have a grilled cheese sandwich with it! It looks so comforting! That looks very good... I haven't made home made tomato soup for ages, I can't face skinning the tomatoes! Susan, thank you. Tomato soup has always been comfort food for me, even when I lived back in India. Mum used to make brothier version when we were sick. 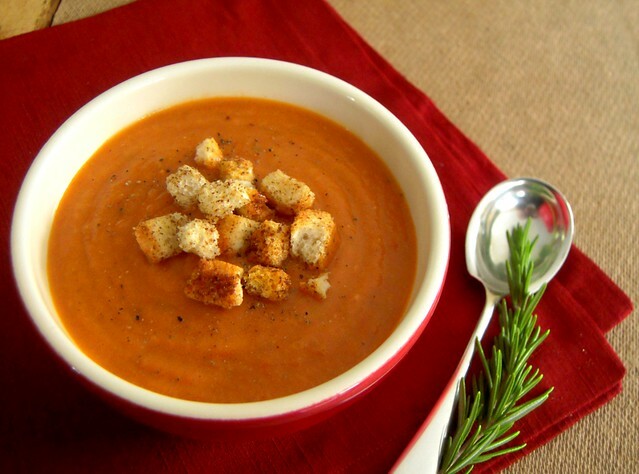 You can't beat a bowl of tomato soup and this version looks delicious - especially with the spicy croutons on top! I love the tip about putting an apple in the bag with under ripe tomatoes! I never would have guessed! I am keen to try this out Mich! Looks tangy & mouthwatering..love ur pictures!! I love homemade tomato soup. I like how this looks so creamy but is packed with vegetables and so healthy. Thanks for the recipe... made it this afternoon and it tastes GREAT! Lovely looking soup. As for croutons. you're right, I've forgotten them several times in the past - I've no idea why that is. I don't think there's any shame in owning basic cookbooks at all. Although maybe there should be a challenge for recipes from embarrassing cookbooks. Lynds, thank you. I don't know where my husband got that apple tip, but it worked like a charm. All our green tomatoes, other than the ones I used for the chutney ripened up, or at least went a lovely yellow. I make tons of tomato sauce for pizzas too. Dom, haha, I was in two minds whether to use that book or not, and then I thought, sod it, its a challenge and I am not going to cheat :-) The croutons were pretty good, for a last minute addition. Corina, yes, I think the added vegetables do make it intensely creamy. I love creamy soups, but my husband prefers chunky, so we havea compromise going on most of the time. Danielle, thank you. Its always such a thrill when someone makes the soup, and so thanks so much for taking the time to come by and let me know how it went. Oh that does look pretty damn yummy. I'm going to have to try this recipe! mmm home-made soup is the best thing ever! And so easy too - this looks gorgeous and I love your photographs. mmmm soup. 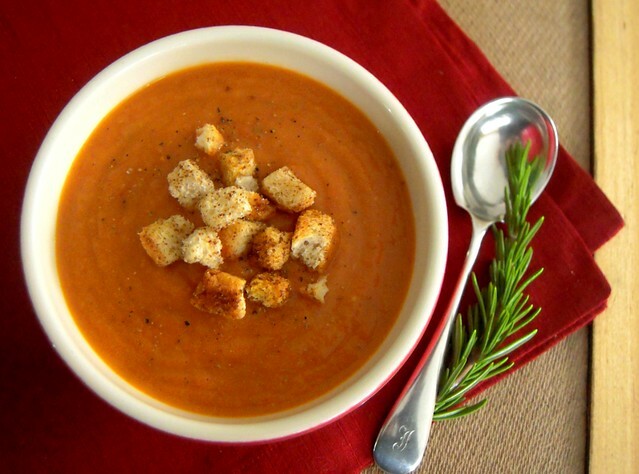 I love roasted tomato soup, and this recipe for it sounds and looks absolutely delicious! It also looks really easy to make. 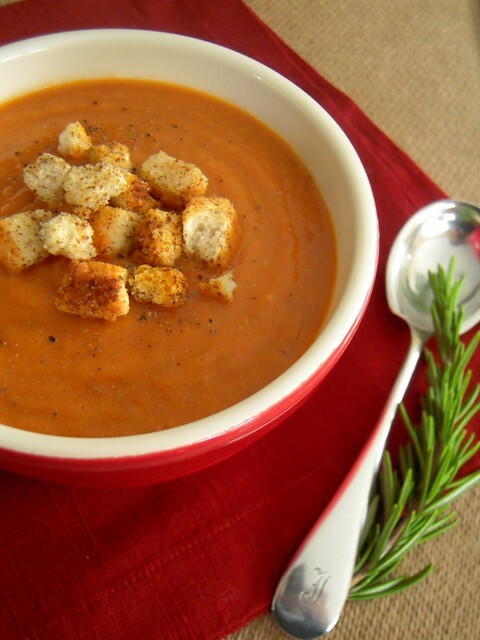 I love the addition of the spiced croutons – such a great combination with the soup. that soup looks simply gorgeous, i just had to click on it! I came over from dom's where he posted a roundup of all the soup recipes this month! great job!